Outfit trends bring top 50 Useful DIY winter fashion projects that can make your winter calm and cozy. I am sure many of you would want to spend their winters doing some amazing DIY projects. Therefore we have come up with some brilliant ideas for you all. Being fashionable is not about spending money over an expensive thing. You can always come up with some brilliant ideas and use DIY tips for winters. It is not that hard to look like a fashionista. Style and fashion go hand in hand, so you can work with your skills and be stylish your way. You need to get started with your old clothes from your wardrobe and try to give them a new look. You can use different embellishment ideas but don’t go overboard in trying to get the decoration. Try to for the most affordable items. You can get items like lace, beads, embellishments, threads etc. Since winters are here, we thought of bringing up some exciting and essential DIY projects and ideas along with instructions that can be done at home quickly. House slippers, sweaters, beaded sweaters, headbands, embellished beanies, upcycled sweater boots etc. are on our list today. 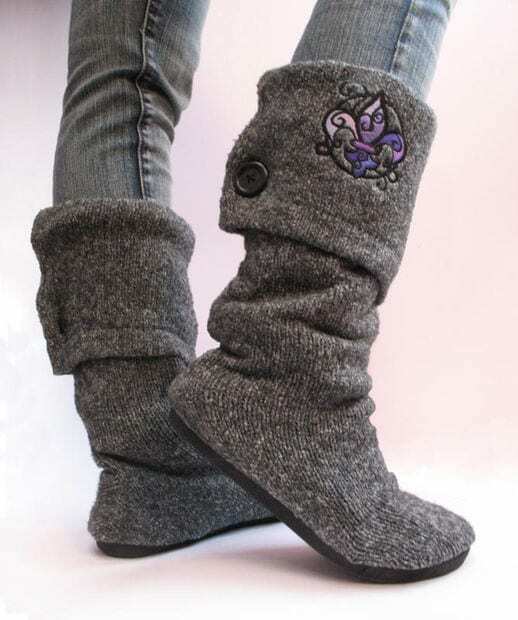 Ladies if you are looking for some comfortable slippers for winters that keep you warm then you are reading the right post. Keeping yourself warm in winters is very important so that you are protected from cold. Below are the instructions on how you could make house slippers. For this, you will need a few things. You will need fabrics for lining, ¼ elastic, and two pieces of hard cloth. Cut down the material according to the size of your feet. Roll the sides and put elastic inside it then use glue to roll it. Once it is dry, then you can wear them. You will need to begin with cutting the sleeves off right where they meet up with the sweater. You need to have two long tubes for this. Keep the left over fabric aside. To try on your on foot you need to cut it down and start glueing the material in the form of your boot shape. Then you need to take a sleeve and turn it inside out. Wear it onto your leg. You need to make sure that the end of the foot is open wide and cuff of the sleeves is up to your calf. Keep the seam of the sleeve on the back side of your leg, so it lines up with your heel. Slip on your flat shoes and stretch the open end of the sleeve around the edges of the shoe. As you can see, just extending the sleeve over the shoe creates feet that look like giant triangles. We need nice shaped boots. Keeping the sweater knit pulled over the toe, pinch the excess back towards your ankle, so it forms to the shape of your foot. Pin this excess in place. You’ll find you will have to pull the most excess from the back, heel and bottom of your foot to get it to form a nice shape. If you want to make a beanie with rhinestones on top of it, then you should select the best beads and sequins. You can easily get studs, sequins, pearls and beads from the shop. Here are some of the ideas on how to make a rhinestone beanie. You will need a beanie, embellishments and some sewing supplies like threads and scissors. For the hat, you will need to cut off the sleeves from the sweater, and then you can lay it on top of your head to see the size. Cut around it and sew it in between. It will form a hat. This project is more interesting and consisting of a simple embellishment than any DIY project. You can design your sweater style by following the steps below. You will have to gather supplies like needle nose pliers, studs and a sweater. Then decide the pattern you want to go with. Lay down the studs on top of it and make a design. Glue the embellishments on it as it will look beautiful. The stud needs to be set on the sweater. Fold your sweater in half through the centre front, making sure the collar, sleeves, and hem are all lined up and straight. Lay a rotary ruler on top of the sweater and run the tailor’s chalk along the fold to mark the centre. Open it up and make sure it looks centred. Cut all the way up through the front of the sweater only. Open up the sweater and smooth out the cut edges – they will curl a bit. Following the instructions, press the iron-on tape right up next to the cut edge on the wrong side of the sweater. Do on both left and right front pieces of the new cardigan. Peel the paper backing off, turn the edge back on itself, so it’s wrong sides together with the adhesive in between and press to create the finished center edge. Sewing with the unfinished edge on top, stitch the two layers together. (I used the 5/8″ line on my sewing machine.) Do not stitch up through the collar part with your machine, tack it down by hand or there will be a very visible and ugly line there. For this, you will need a piece of cloth of about 1/8th yard and a thread. Then you need to measure your head. Once you have measured it, you will put the cloth on top of another and sew them together. Then turn right side out and top stitch together. For this, you will need a sweater. The only thing you need to check is that the sweater is flexible so that it can fit over your knee and legs. For this cut the sleeves of the same length and check if they fit you well. Once you are done with it, you can put a colourful elastic around it. Winter fashion gets boring if you don’t change your sweater styles. Wearing simple sweaters can make you look dull. Therefore you should know how to play with colours and styles. You can go for embellished or beaded work on sweaters. A DIY beaded sweater would be fun. Look for some styles online, and then you can start working on it. You will need a cardigan sweater, beads, rhinestones and glue. Lay down your sweater on a floor and place your beads and rhinestones on your sweater. Select the design you want and glue your beads and stones to it. Make sure you use a good quality glue. Press down on the beads and let them dry. #22 DIY Add on Pockets over Sweater. I hope you enjoyed reading our post. Do leave your comments if you would want to know more DIY projects. Spend your winter holidays doing some amazing DIY projects.